Sweating in the hot summer heat? Tired of dealing with issues with your	freon? 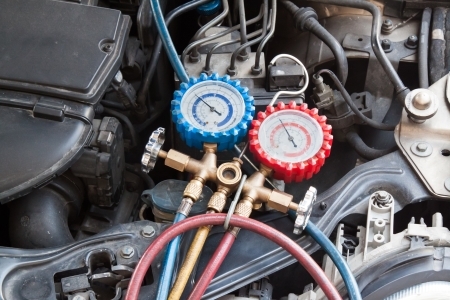 If your vehicle’s heating and AC system is not working properly,	you could be dreading your drive time. If you want to drive down the freeway	without having to worry about your air conditioning kicking the bucket,	contact our Phoenix auto repair experts at Xpress Automotive! Our technicians have the experience necessary to quickly diagnose and repair	your vehicle and carry a wide range of parts so that they can resolve	your concerns without delay. Our team of honest and dedicated mechanics	will work hard to diagnose the issue with your AC or heating system and	will always do their best to keep your overall cost low. When you’re ready to schedule a service at our Phoenix auto repair	shop, please	reach out to our service center by calling (480) 460-2400 at your earliest convenience. Request an appointment with one of our technicians by filling out our online form. Our preventative services range from simple oil changes to battery replacement and more. Swing by our location or give us a call. We’re here to help keep your car on the road! Your Complete Car Care Xperts!